Now Casting: De-clutter and Renovation Show. Are you or someone you know ready to de-clutter your house? Does it seem impossible to take back your square footage simply by organizing? Is a bigger house starting to look like the only option due to all the stuff? 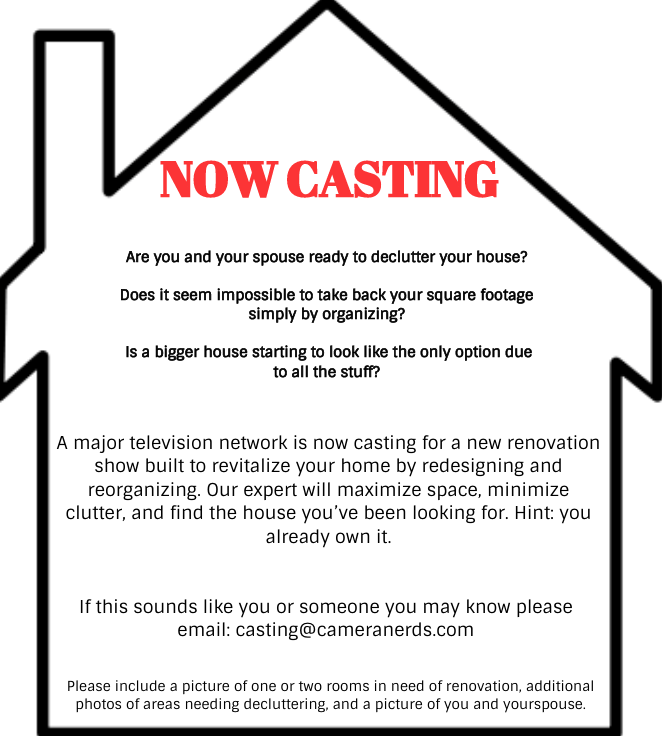 A major television network is now casting for a new renovation show built to revitalize your home by redesigning and reorganizing. Our expert will maximize space, minimize clutter, and find the house you’ve been looking for. Hint: you already own it. Please include a picture of one or two rooms in need of renovation, additional photos of areas needing decluttering, and a picture of you or your nomination.